We absolutely love Philly weddings! Although we are primarily based in New York, we never mind traveling to the beautiful city of Philadelphia, PA. For some reason photographing in Philly reminds me of my days in Cambridge Massachusetts (the whole England vibe!). The other, and perhaps equally major, reason for our affinity to Philly weddings is due to our amazing experience with the Philly couples who we've worked with so far. Believe it or not, this image was actually taken during midday when the sun was, well let's just say not in a flattering position. As it turned out, this was one of our most favorite photos from that Philly wedding. This is one image that you will probably see over and over in all of our portfolio/add listings. Now, I don't want to sound like midday is my favorite time of the day to shoot outdoors, LOL. However, the point here is, as wedding photographers we often have to be problem solvers and deal with the whole range of weather conditions, from poor light quality to harsh winter weather. In this case, we had minimal time between the wedding ceremony and the cocktail hour, which the couple did not want to miss. Hence, the bridal party promptly went to the Philadelphia Museum of Art, where we planned to take some group portraits as well as some couple shots. This image is actually a composite of two separate images taken of the same scene and only seconds apart. 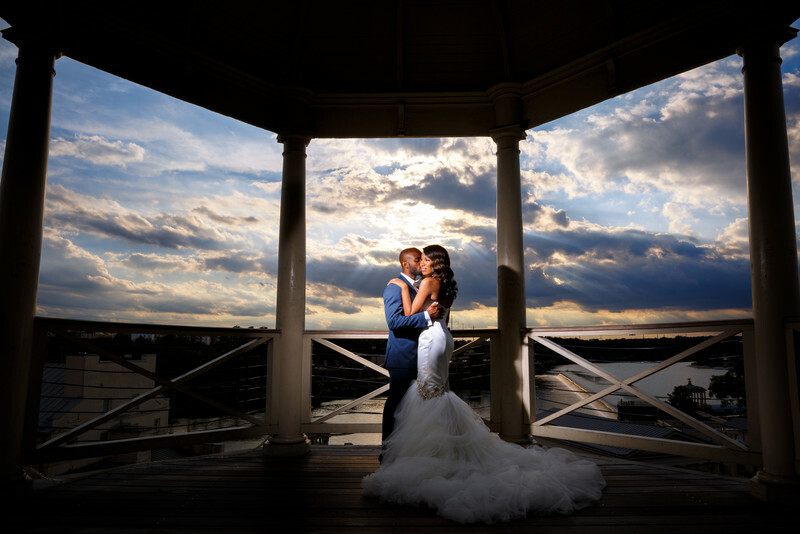 This technique allowed us to basically like the couple with off-camera flash and yet have an exposure to bring in the sky. It's always amazing to know that we pulled off an images that hangs in our couples living room!